High body temperature. If the body is too hot, blood vessels dilate to let more blood reach the skin, where the blood cools. This causes the skin to look flushed. 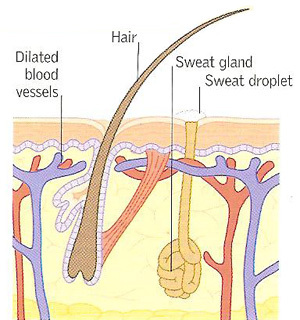 Sweat glands produce more sweat, which evaporates to cool the skin. Low body temperature. If the body is too cold, the blood vessels narrow. 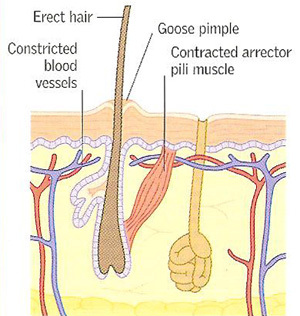 The arrector pili muscles contract, lifting hairs and pulling on the skin to form goose pimples. The erect hairs trap an insulating layer of air next to the skin. Thermoregulation is the body's internal, automatic temperature regulating mechanism, which is controlled by the hypothalamus in the brain. The skin plays a significant role in regulating body temperature. In contrast with some animals, humans do not possess a thick fur coat to provide warmth. Instead, we have a complex thermoregulation system that includes features such as special blood vessels in the skin that are concerned solely with conservation and loss of heat. A layer of fat under the skin provides extra insulation.